Shipping containers have not changed substantially in more than 50 years, until now with the introduction of the CakeBoxx line of intermodal cargo containers. The unique, doorless design provides superior security and theft prevention, cargo safety and damage resistance, faster loading and unloading and streamlined inspections. The CakeBoxx will provide added cargo safety and security that is not available in a standard container. CakeBoxx Technologies today announced a completely new type of intermodal cargo shipping container, the CakeBoxx. The patented, doorless CakeBoxx container is the first major design upgrade to the standard intermodal cargo container that has been in constant use since the 1950s. CakeBoxx is compliant with ISO standards, exceeds all CSC certification testing requirements and is dimensionally identical to standard, “back door” style shipping containers. 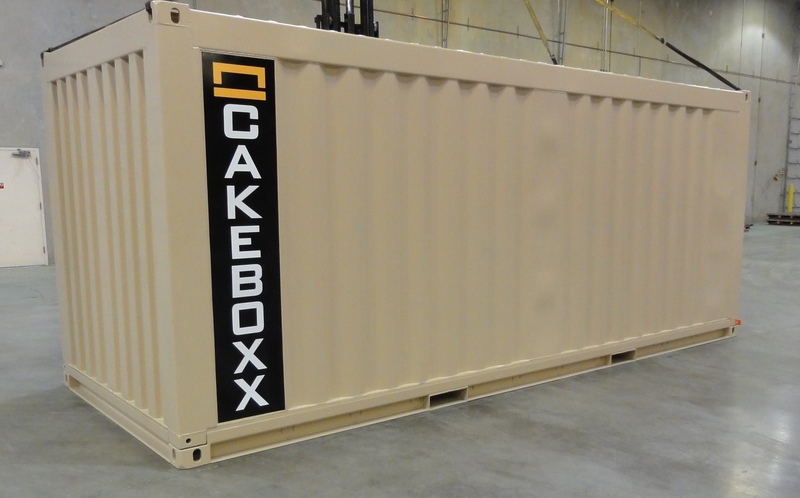 However, the unique CakeBoxx design provides a number of key functional and cost advantages over standard containers, including: superior security and theft prevention, enhanced cargo safety and damage resistance, more usable interior volume and reduced fuel costs. 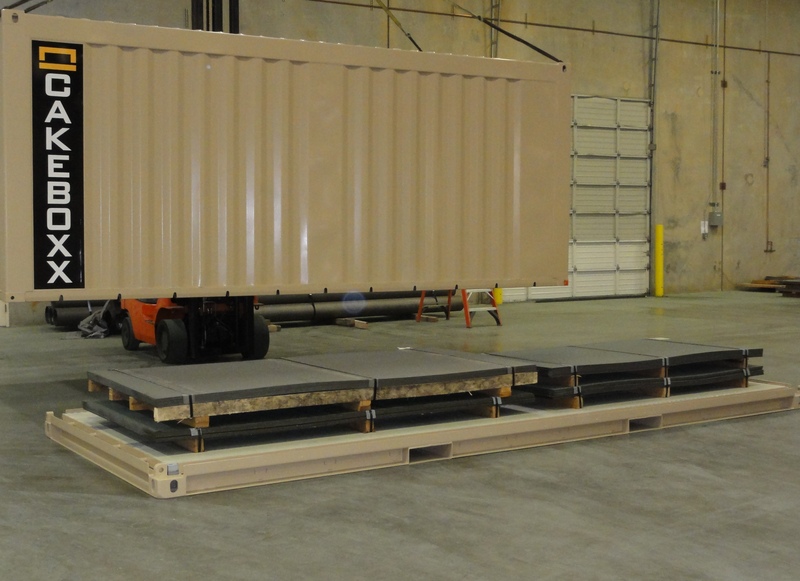 The doorless design also enables faster loading and unloading, streamlines Customs inspections and provides the ability to carry more diverse cargo with multiple configurations. A CakeBoxx container is simple in concept. The CakeBoxx container has two integrated components: the deck and the lid. The lid is raised and lowered by all standard container handling equipment commonly used at ports and cargo-loading facilities or by a medium-sized forklift using an inexpensive spreader bar or sling attachments. The CakeBoxx lid attaches to the deck with a super-strong latching and locking mechanism that provides an all-around seal, keeping cargo safe, dry and secure. Once the lid is connected to the platform, the CakeBoxx is dimensionally identical to standard ISO containers. CakeBoxx containers are transparent in the operational supply chain – they look and act like all other containers and seamlessly integrate into all intermodal processes, including stacking, loading, storage and terminal transfers. "With over 60 years of direct operational experience in the British and French Customs administrations between us, we feel that the revolutionary CakeBoxx solution will blow some fresh air into the transportation market, assist in the security of shippers' goods and will help Customs to secure the appropriate revenues,” said Chris Clark and Michel Lagarde, managing directors of AEON Customs Consultancy Limited, United Kingdom. “It offers value that traditional containers simply cannot deliver." Cargo containers are the critical component in complex, fast-paced, intermodal supply chains. The cargos in them are more expensive and more exposed than ever, making them far more attractive to steal and more likely to be used as a conveyance for illicit material. Many more cargos are sensitive to temperature and humidity changes and are more susceptible to damage; and all cargo is subject to more inspections for health, safety and national security purposes. To meet the needs of modern commerce, containers need to address all of these needs and concurrently must load, discharge and be handled more quickly for companies to meet product demands and keep costs competitive. Superior Security and Theft Protection – Thousands of intermodal containers are broken into each year, costing manufacturers, shippers and retailers billions of dollars in lost and damaged cargo. Most containers are breached at their weakest point: the doors. 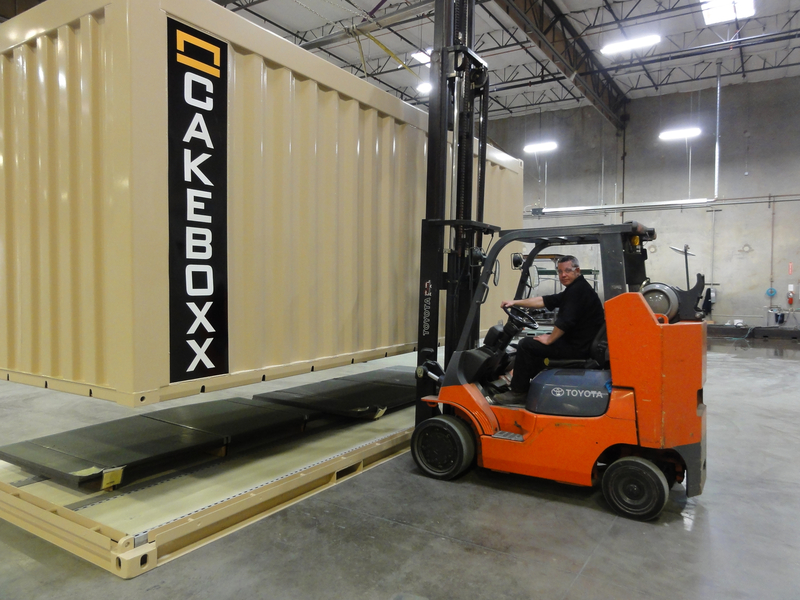 The unique CakeBoxx design prevents access by unauthorized persons because once a CakeBoxx container is sealed, nothing gets in or out – whether the container is onboard ship, in a stack at a terminal or on a railcar or truck. Cargo Safety and Damage Resistance – CakeBoxx provides stronger structural integrity than containers with doors and eliminates the probability of door failure and container collapse. For cargos that normally require a flat rack or open-top container, CakeBoxx offers the same easy access for loading and unloading but keeps all cargo safely within the interior of a robust, enclosed container. Operating Cost Reductions and Efficiency – Because cargo can be accessed from all four sides and overhead, the CakeBoxx design enables faster, easier, more efficient loading, unloading and inspections, improving terminal and Customs clearance velocity. Insulated CakeBoxx models can keep cargo cool without refrigeration equipment. This means no expensive diesel-fueled generator sets to operate and maintain, and no greenhouse gas emissions from the CakeBoxx. Reduced Total Ownership Cost, Faster ROI – CakeBoxx enables shippers to reduce their total cost of container ownership. Because there are fewer moving and wear parts, maintenance and repair costs are greatly reduced. This, combined with the greater safety and efficiency of CakeBoxx containers, means lower operating costs, reduced insurance costs, and faster return on your investment. CakeBoxx – the full-size commodity box available in both 20’ and 40’ lengths, 8’ and 8.5’ heights and Hi-Cube. ShortBoxx – half-height (4’3’’) box available in both 20’ and 40’ lengths with optional bladder and folding sidewalls. FreshBoxx – for local shipping of perishable or temperature-sensitive goods, available in 20’ and 40’ lengths. CakeBoxx is patented – there is only one true CakeBoxx. The design exceeds all CSC certification testing requirements. CakeBoxx containers are dimensionally compliant with ISO 668-1995 requirements, use ISO 1161approved corner castings and exceed all ISO 1496-1 test requirements. CakeBoxx Technologies is accepting orders for delivery in Fall 2012 for CakeBoxx, ShortBoxx and FreshBoxx models. Additional models are scheduled for release early in 2013. For more information, please visit: cakeboxx-technologies.com. For investor queries please contact Daine Eisold at: daine (at) cakeboxx-technologies (dot) com or 703-869-3336. CakeBoxx Technologies designs, builds, markets, licenses and sells patented intermodal cargo shipping containers to the global intermodal transportation market. The company has developed a premium quality product line for high-end, high-throughput customers who want to ensure maximum safety, security and efficiency from stuffing point to end-user. The patented CakeBoxx two-piece (doorless) construction is an innovation in the container industry. It was conceived, designed and built by its inventor, Garry Whyte, to respond specifically to the evolving market pressures of decreasing margins and increasing security concerns. After five years of market research, design and product development, CakeBoxx Technologies was launched to bring the CakeBoxx doorless intermodal cargo shipping container product line to the global market.